One of my maternal grandmother’s favorite aunts was Delia N Mills. She was her mother, Minnie Bell Mills, younger sister and was only four years older than my grandmother. 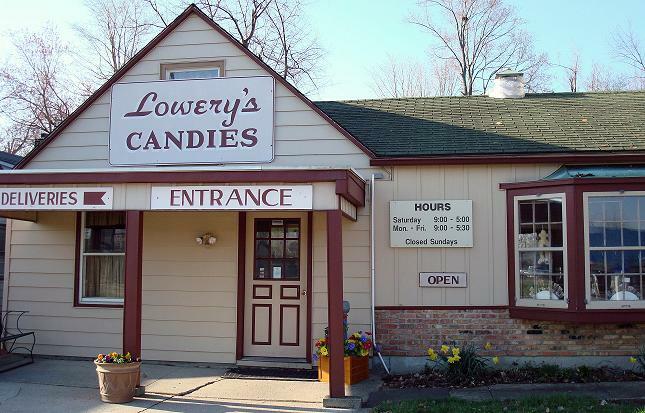 This will be the story of Delia and Lowery’s Candies. It comes from the June 7, 1992 edition of The Muncie (Indiana) Star. Perky as a wren, green-eyed, sharp and overflowing with stories, Delia Lowery is “the original Lowery.” More than 50 years ago, she invented the recipes for the Lowery candies which are still sold in Muncie, Anderson, and Kennard. Dee, her nickname since school days, will be 95 on Sept. 5, but she doesn’t look her age nor fit any stereotype. Slim, interested in everything, she even keeps her hair the same golden brown its always been. Lowery learned “how to dip chocolates in Johnnie Springer’s candy shop.” She couldn’t make the “throw” or swirl on top correctly and wanted to quit, but her dad wouldn’t let her. The throw tells the flavor of the creme inside the chocolate. “O” stands for orange and “a little snake on top,” according to Lowery, means the creme is peanut butter, for example. In the early 1930s, Lowery worked for Henry Roller, who had a snack shop and soda fountain at 107 E Jackson St. He made “Dark Secrets,” a delectable dark chocolate candy. Roller sold Lowery that formula reluctantly, and she began making dark secrets her way, calling them “Chatterbars.” She wanted to start a candy shop. In 1941, her husband, the now late Garrett Lowery, quit “his good job at Chevrolet” to help her realize the dream. The first year, Dee started making filled Easter eggs, which became great sellers. After cleaning coconut shells they brought back from Florida, the Lowerys used them as molds for the big eggs. They they filled each chocolate shell molded that way with other candies. They put six eggs on display, planning to take orders, but one woman bought them all. The next year, the Lowerys bought small, medium and large aluminum egg and rabbit-shaped molds. The sold nearly a 1,000 molded candies that year. “There’s a big difference in kinds of sugar and kinds of chocolate. I bought the best,” Lowery adds. “I didn’t use the same kind of sugar to make toffee as I did cremes. I taught Garrett, and he became a good candymaker. When Garrett Lowery had a stroke, they sold the business to his cousin, Don Brown, and wife Thelma and Garrett’s sister, Pauline Good, and her husband John. After Dee taught Thelma and Pauline the art of dipping chocolates, the Browns in 1965 moved the candy business to 6019 Kigore Ave. Still in operation there, they continue to use Dee’s candy recipes and the name Lowery’s Candies. Their daughter, Vicky Good, manages that shop and Thelma and son, Michael Brown, also work there. Another daughter comes in from Ohio to help out at extra busy times. Garrett’s niece, Terry Vickery, manages Good’s Candies, Kennard, and his nephew, John Richard Good, has Good’s Candies in Anderson. Both places use Dee’s recipes. It’s hard to find her at home. She attends church activities and senior citizen meetings at main Street United Methodist Church. “Lee Browning plays the piano. Lon England sings, and all us senior citizens join in.” she says. The Lowerys had no children, but her family, including nephews Eddie Mills, Rodger Green, Howard Haworth, Gene Gordon and Lee Brant, help her lead a busy life. “They’re all so good to me.” she says. In addition to relatives, the other “person” in her life is Tippy, her dog. In the 1920 United States Federal Census, Delia is the only child left at home at the age of 21. She is listed as a Candymaker. She doesn’t marry Garrett until 1923. I remember a box of Lowery’s candy showing up at my grandmother’s house every Christmas as I was growing up. I never truly appreciated the story behind the candy until now. I wish I had met Delia N Mills Lowery. She seems like quite a woman! This entry was posted in Wright and tagged Candy, Chatterboxes, Chocolate, Dark Secrets, Delia Lowery, Delia Mills, Lowery, Lowery's Candies, Rene Baron. Bookmark the permalink.